The government will have to postpone the provincial council elections by one year to enable electoral experiments, Prime Minister Ranil Wickremesinghe said yesterday. “We have started experimenting with the 25 per cent women representation in local bodies. Each party will have to do it and rectify shortcomings if there are any. It will be then extended to the provincial council level. This is why we have to postpone provincial council by a year,” the Premier said. “Government is focusing on involving more women in politics. Only a few women get involved in politics today. It is same with the youth. 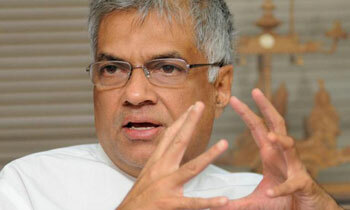 I had to push people like Mr Senasinghe in to politics. They were reluctant to take up politics as a result of the manapa system. However today we have introduced a mixed system at the local government level. Those who obtain small percentages of votes will now have the opportunity to come into local bodies,” the Prime Minister said. “We are focusing on women when it comes to economic development. Women are in several sectors in the economy. Economy is virtually run by women. Women involvement has to be increased. Women account for 35 per cent of the country’s workforce. Government’s target is to increase it to 40 per cent. Minister Senasinghe is engaged in a woman’s empowerment programme and is training them to become entrepreneurs in the apparel industry. This is a lucrative business. Both young men and women prefer tailor made clothes rather than purchase them from the market. It is same worldwide. There are others who prefer branded clothes. If I come here in five year’s time some of these women would have become entrepreneurs and also some of them may do their sewing using computers considering the technological development. Time will come when it will be possible to download patterns from the mobile phones,” he said. The electoral experiments can be done in early 2018. No need to delay it untill 2019 end. Now tell that to a Chinese with a pony tail. Enough of experiments. hold elections and face the nation. Government has no right at all to delay any election. Do not give any lame excuses for postponing them. People are eagerly awaiting an opportunity to teach these rogues a lesson they will never forget. Does not matter why you postponed the elections but what matters is what you did in your time in power and the whole nation knows what you did. You may squeeze through our wonky legal system but you are done and dusted as far as the voters are concerned. The mistake you and your likes did was to think that you can fool all the people all the time.So enjoy yourself with your crooked friends the clock is ticking. Can anyone by force push women and youth enter into politics. if anyone tries to make rules and deny others rightsby doing such things also not democracy. It should be open to every person without any restriction whether the candidate is a woman or a man.